Name Variation Christen Nielsen was also known as Kristen. He was the son of Niels Nielsen and Ane Mikkelsdatter. 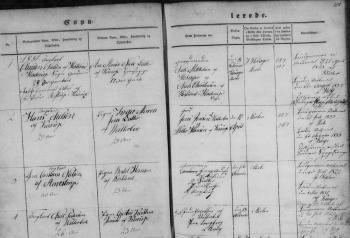 [S383] The Danish National Archives; Church Records, Christen Nielsen birth record - 27 Dec 1823 - Frederiks, Lysgaard, Viborg, Denmark. 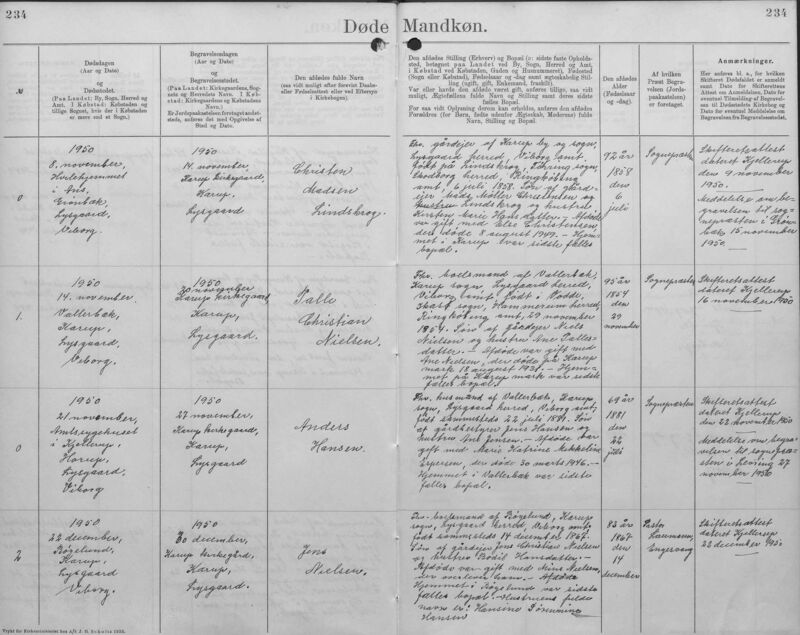 [S384] The Danish National Archives; Census Records, 1901 census Kipno. D3012. Parish: Karup. Hundred: Lysgaard. County: Viborg. Record no. 45 of 301. 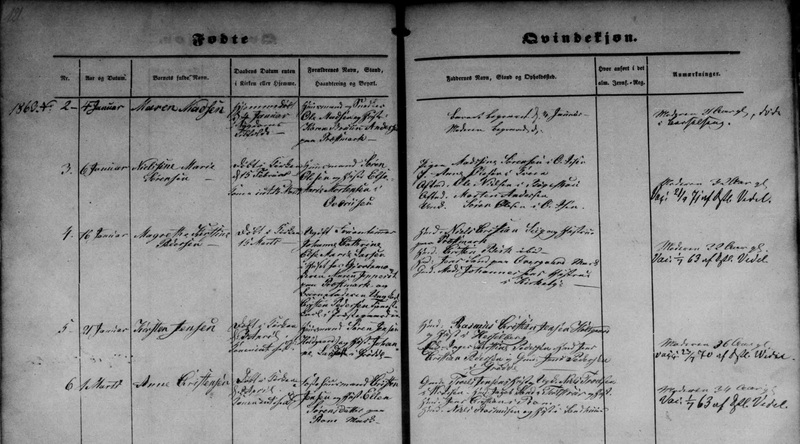 [S383] The Danish National Archives; Church Records, Maria Christine Christiansdatter and Christen Nielsen marriage record - 27 Dec 1859 - Karup, Lysgaard, Viborg, Denmark. [S383] The Danish National Archives; Church Records, Christen Nielsen death record - 18 Jun 1917 - Karup, Lysgaard, Viborg, Denmark. [S384] The Danish National Archives; Census Records, Viborg/Lysgård/Frederiks Søndre parish/Census/1834/Page No. 12. [S384] The Danish National Archives; Census Records, Viborg, Lysgaard, Frederiks, Frederiks Sogn, Aarestrup - en Gaard, 51, FT-1840, B4485. [S384] The Danish National Archives; Census Records, 1870 Denmark census. Kipno. D2773. Parish: Karup. Hundred: Lysgaard. County: Viborg. Record no. 13 of 202. 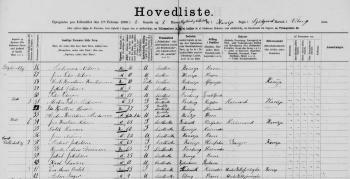 [S384] The Danish National Archives; Census Records, 1880 Denmark census. Kipno. D2902. Parish: Karup. Hundred: Lysgaard. County: Viborg. Record no. 16 of 253. 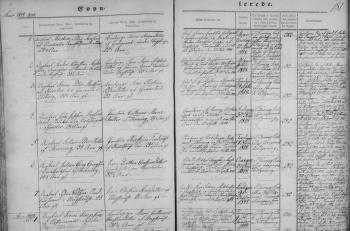 [S384] The Danish National Archives; Census Records, 1890 Denmark census. Kipno. D2976. Parish: Karup. Hundred: Lysgaard. County: Viborg. Record no. 33 of 262. [S384] The Danish National Archives; Census Records, Kipno. D3012. Parish: Karup. Hundred: Lysgaard. County: Viborg. Record no. 47 of 301. 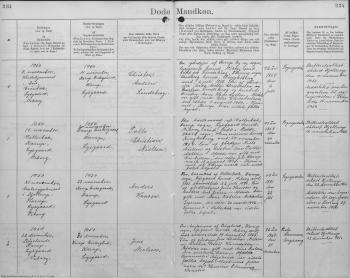 [S384] The Danish National Archives; Census Records, 1901 census Denmark - Kipno. D3012. Parish: Karup. Hundred: Lysgaard. County: Viborg. Record no. 44 of 301. 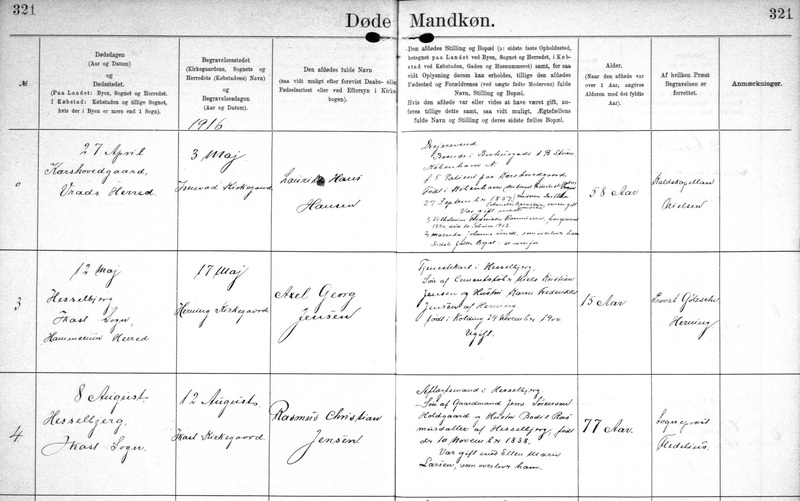 [S384] The Danish National Archives; Census Records, 1901 census Kipno. D3012. Parish: Karup. Hundred: Lysgaard. County: Viborg. Record no. 48 of 301. Name Variation Peter Nielsen was also known as Peder Nielsen Sund. He was buried on 23 September 1858 at Torning, Lysgaard, Viborg, Denmark. [S383] The Danish National Archives; Church Records, Peder Nielsen birth record - 11 Dec 1825 - Frederiks, Lysgaard, Viborg, Denmark. [S383] The Danish National Archives; Church Records, Peder Nielsen Sund and Christine Jensdatter marriage record - 09 Dec 1848 - Torning, Lysgaard, Viborg, Denmark. [S383] The Danish National Archives; Church Records, Peder Nielsen death record - 17 Sep 1858 - Torning, Lysgaard, Viborg, Denmark. [S384] The Danish National Archives; Census Records, Viborg/Lysgård/Thorning parish/Census/1850/Page No. 20. [S383] The Danish National Archives; Church Records. Name Variation Jens Christian Nielsen was also known as Jens Kristian. He was buried after 8 March 1899 at Karup, Lysgaard, Viborg, Denmark. Translation: Born January 9, baptised 10 January 1822. The son of farmer Niels Nielsen and his wife Ane Michelsdatter in Aarestrup. [S383] The Danish National Archives; Church Records, Jens Christian Nielsen birth record - 09 Jan 1822 - Frederiks, Lysgaard, Viborg, Denmark. 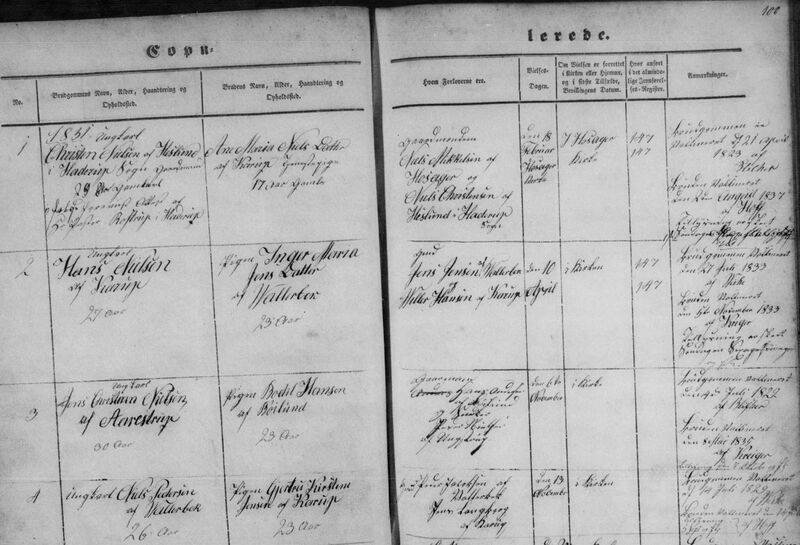 [S383] The Danish National Archives; Church Records, Jens Christian Nielsen and Bodil Hansen marriage record 06 Nov 1851 Karup, Lysgaard, Viborg, Denmark. 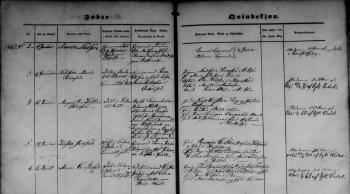 [S383] The Danish National Archives; Church Records, Niels Nielsen and Ane Maria Ostergaard marriage record - 02 May 1884 - Bording, Hammerum, Ringkøbing, Denmark. 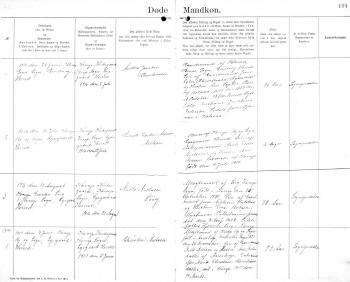 [S383] The Danish National Archives; Church Records, Hansine Sorenmine Hansen and Jens Nielsen marriage record - 15 June 1893 - Karup, Lysgaard, Viborg, Denmark. [S383] The Danish National Archives; Church Records, Jens Kristian Nielsen death record - 08 Mar 1899 - Karup, Lysgaard, Viborg, Denmark. 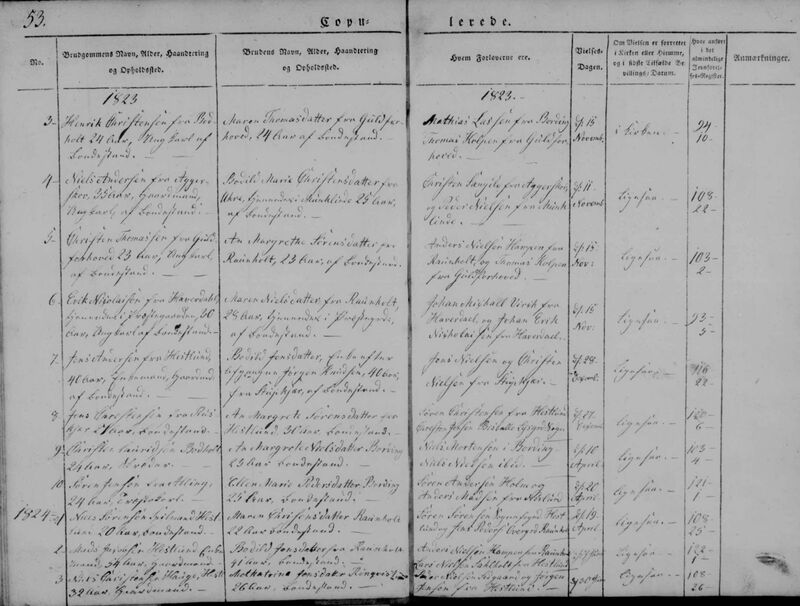 [S384] The Danish National Archives; Census Records, 1855 census Denmark - Kipno. D2318. Parish: Karup. Hundred: Lysgaard. County: Viborg. Record no. 163 of 200. [S384] The Danish National Archives; Census Records, 1860 census Denmark. Kipno. D2398. Parish: Karup. Hundred: Lysgaard. County: Viborg. Record no. 145 of 221. 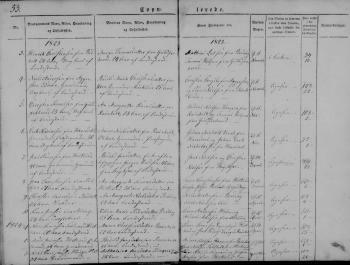 [S384] The Danish National Archives; Census Records, 1870 Denmark Census - Kipno. D2773. Parish: Karup. Hundred: Lysgaard. County: Viborg. Record no. 199 of 202. [S384] The Danish National Archives; Census Records, 1880 Denmark Census - Viborg, Lysgaard, Karup - Jens Kristian Nielsen. 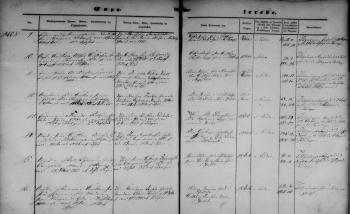 [S384] The Danish National Archives; Census Records, 1890 census Kipno. D2976. Parish: Karup. Hundred: Lysgaard. County: Viborg. Record no. 223 of 262. [S384] The Danish National Archives; Census Records. Name Variation Jens Peter Emil Laustsen was also known as Laursen. He was the son of Laust Poulsen and Edel Marie Pedersdatter. Jens Peter Emil Laustsen was christened on 5 February 1854 at Almind, Viborg, Denmark. [S383] The Danish National Archives; Church Records, Churchbook 1847 - 1868 Almind, Ny udgave/Page No. 13 - Born Men 1853-1854. 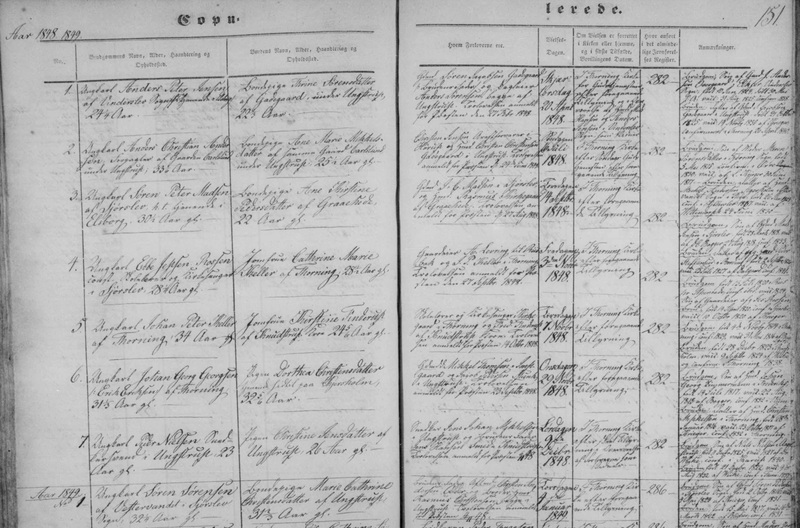 [S383] The Danish National Archives; Church Records, Petrine Pedersen and Jens Peter Emil Laustsen marriage record - 31 July 1900 - Frederiks, Lysgaard, Viborg, Denmark. [S384] The Danish National Archives; Census Records, 1860 Denmark census. Kipno. D6907. Parish: Lysgaard. Hundred: Lysgaard. County: Viborg. Record no. 127 of 354. 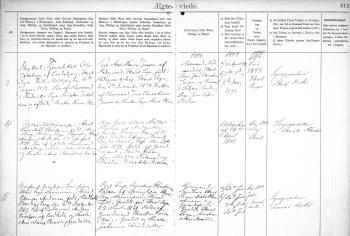 [S384] The Danish National Archives; Census Records, 1880 Denmark census.Kipno. C5179. Parish: Lysgaard. Hundred: Lysgaard. County: Viborg. Record no. 431 of 508. [S384] The Danish National Archives; Census Records, 1906 Denmark Census. Katballe - Knækkeborg, Lysgård, Lysgård, Viborg, Denmark. [S384] The Danish National Archives; Census Records, 1925 Denmark census - Lysgaard, Lysgaard, Viborg, Denmark - Laursen, Jens Peter Emil. [S383] The Danish National Archives; Church Records, Niels Sørensen and Maren Christensdatter marriage record - 19 Apr 1824 - Bording, Hammerum, Ringkøbing, Denmark. [S384] The Danish National Archives; Census Records, 1834 Denmark census. Kipno. B9459. Parish: Bording. Hundred: Hammerum. County: Ringkøbing. Record no. 287 of 563. [S383] The Danish National Archives; Church Records, Inger Nielsen birth record - 13 May 1836 - Bording, Hammerum, Ringkøbing, Denmark. Name Variation Kirsten Jensen was also known as Kjestine Jensen. She was the daughter of Søren Jensen Holdgaard and Johanne Larsdatter. [S383] The Danish National Archives; Church Records, Kirsten Jensen birth record - 21 Jan 1863 - Ikast, Hammerum, Ringkøbing, Denmark. [S384] The Danish National Archives; Census Records, Ringkøbing, Hammerum, Ikast, Grødde, Denmark 1870 census. Name Variation Lars Pedersen was also known as Lars Bøggilds. Name Variation Lars Pedersen was also known as Lars Bogilds. Lars Pedersen married Kiersten Hansdatter. He was the son of Peder (?). 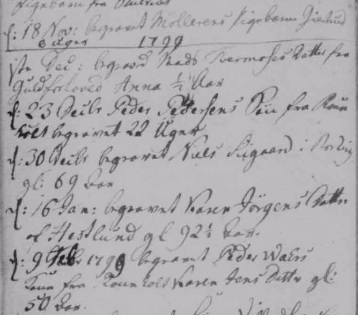 [S383] The Danish National Archives; Church Records, 1787 Denmark Census - Ringkøbing, Hammerum, Ikast, Bøggild - Lars Pedersen. Married Name Her married name was Pedersen. Kiersten Hansdatter married Lars Pedersen, son of Peder (?). Kiersten Hansdatter was born in 1755 at Denmark. Name Variation Else Marie Larsdatter was also known as Else Maria Bogild. She was the daughter of Lars Pedersen and Kiersten Hansdatter. [S383] The Danish National Archives; Church Records, Else Marie Larsen birth record - 16 Dec 1777 - Ikast, Hammerum, Ringkøbing, Denmark. He was the son of Lars Pedersen and Kiersten Hansdatter. 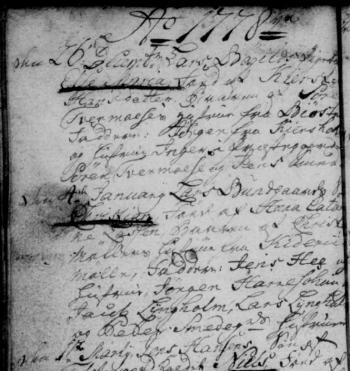 [S383] The Danish National Archives; Church Records, Christian Fischer Larsen birth record -24 Feb 1782 - Ikast, Hammerum, Ringkøbing, Denmark. [S383] The Danish National Archives; Church Records, Anna Larsdatter birth record - 16 Oct 1785 - Ikast, Hammerum, Ringkøbing, Denmark. Peder (?) was born at Denmark. Inger Pedersdatter was born circa 1744 at Denmark. She was the daughter of Peder (?). Name Variation Niels Sügaards was also known as Sügaard. Name Variation Niels Sügaards was also known as Niels Madsen Siigaard. Name Variation Niels Sügaards was also known as Niels Madsen. Name Variation Niels Sügaards was also known as Niels Sügaands. Niels Sügaards was born circa 1729 at Denmark. He married Inger Clemensdatter before 1753 at Ikast, Hammerum, Ringkøbing, Denmark. 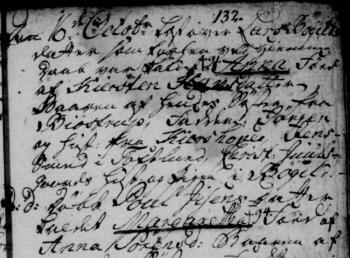 [S383] The Danish National Archives; Church Records, Niels Madsen Siigaard and Anne Clausdatter marriage record - 09 Oct 1791 - Bording, Hammerum, Ringkøbing, Denmark. 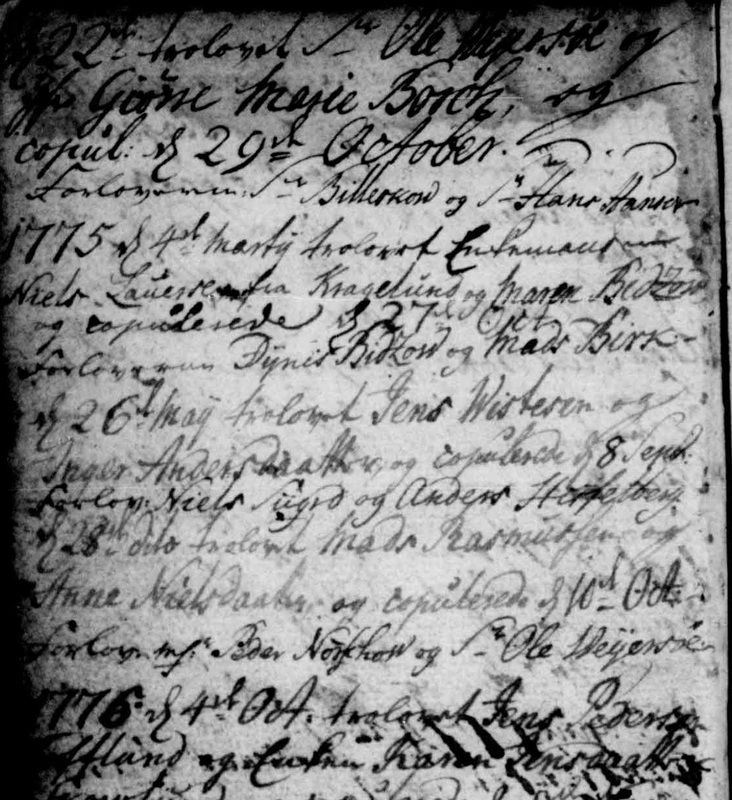 [S383] The Danish National Archives; Church Records, Niels Sügaard death record - 30 Dec 1798 - Bording, Hammerum, Ringkøbing, Denmark. [S384] The Danish National Archives; Census Records, Kipno. B9099. Parish: Bording. Hundred: Hammerum. County: Ringkøbing. Record no. 272 of 349. 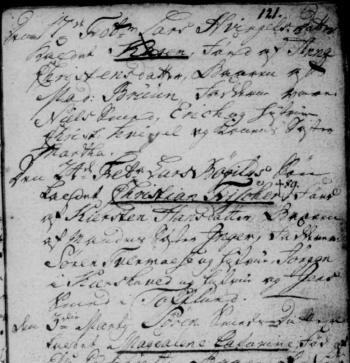 [S383] The Danish National Archives; Church Records, Potential best man on marriage record for Niels Sugaand - 26 May 1775 - Ikast, Hammerum, Ringkøbing, Denmark. 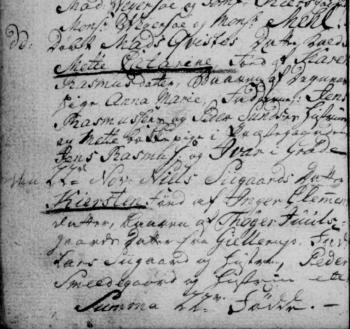 [S383] The Danish National Archives; Church Records, Potential best man on marriage record for Niels Sugaand - 1776 - Ikast, Hammerum, Ringkøbing, Denmark. [S383] The Danish National Archives; Church Records, Birthe Nielsdatter birth record - 1753 - Ikast, Hammerum, Ringkøbing, Denmark. 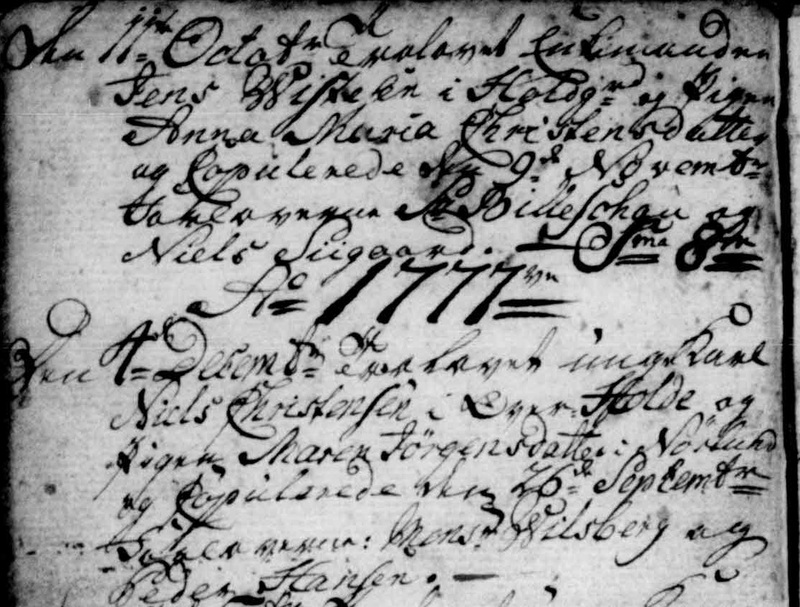 [S383] The Danish National Archives; Church Records, Mads Nielsen birth record - 1756 - Ikast, Hammerum, Ringkøbing, Denmark. [S383] The Danish National Archives; Church Records, Clemen Nielsen birth record - 1758 - Ikast, Hammerum, Ringkøbing, Denmark. 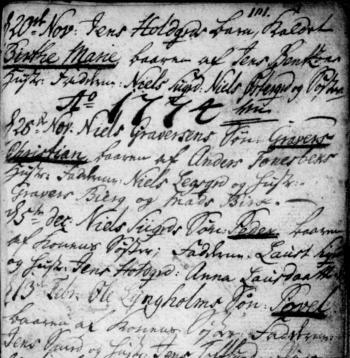 [S383] The Danish National Archives; Church Records, Anna Nielsdatter birth record - 1760 - Ikast, Hammerum, Ringkøbing, Denmark. 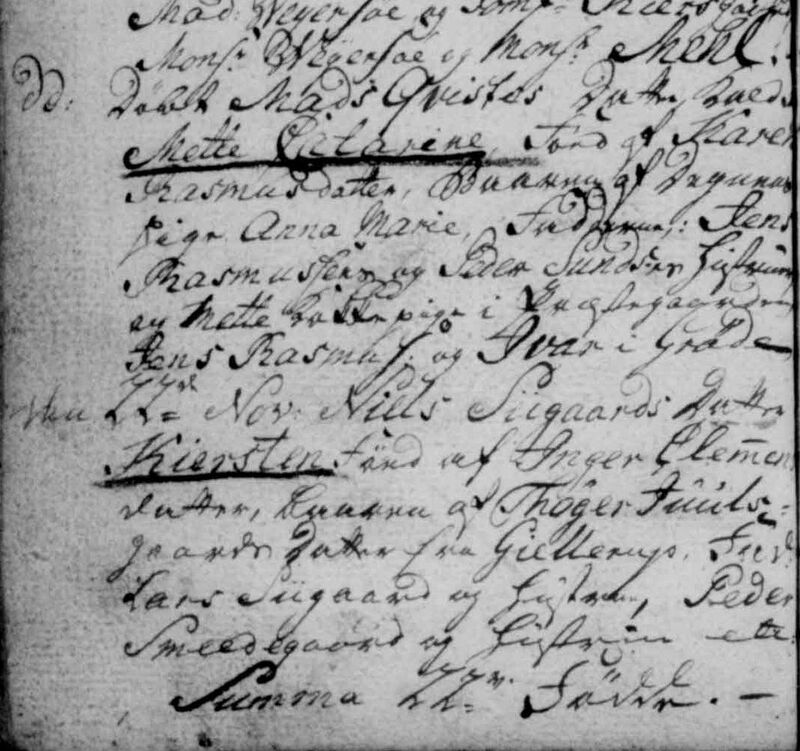 [S383] The Danish National Archives; Church Records, Karen Nielsdatter birth record - 1763 - Ikast, Hammerum, Ringkøbing, Denmark. 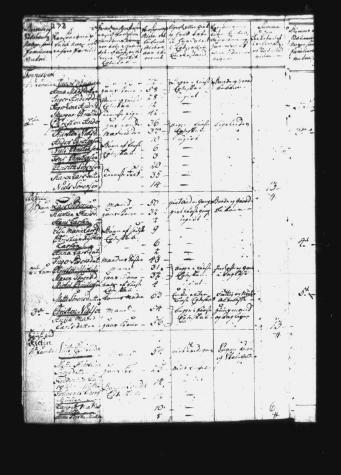 [S383] The Danish National Archives; Church Records, Rem Nielsen birth record - 1768 - Ikast, Hammerum, Ringkøbing, Denmark. 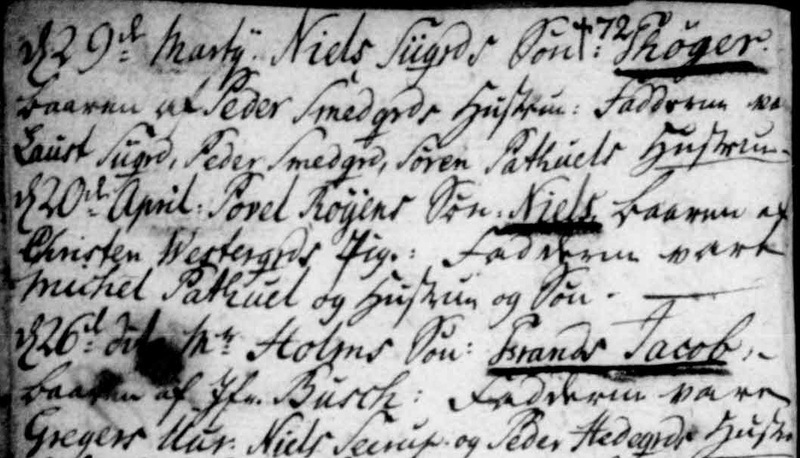 [S383] The Danish National Archives; Church Records, Thoger Nielsen birth record - 06 Mar 1771 - Ikast, Hammerum, Ringkøbing, Denmark. [S383] The Danish National Archives; Church Records, Thoger Nielsen birth record - 29 Mar 1772 - Ikast, Hammerum, Ringkøbing, Denmark. [S383] The Danish National Archives; Church Records, Peder Nielsen birth record - 1774 - Ikast, Hammerum, Ringkøbing, Denmark. 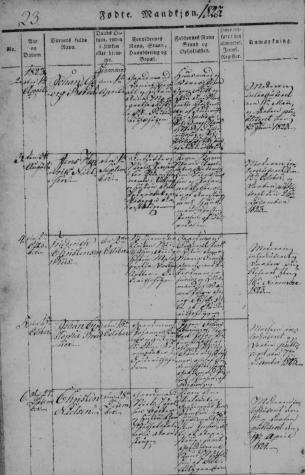 [S383] The Danish National Archives; Church Records, Johanne Nielsdatter birth record - 08 Apr 1777 - Ikast, Hammerum, Ringkøbing, Denmark. [S383] The Danish National Archives; Church Records, Kiersten Nielsdatter birth record - 22 Nov 1779 - Ikast, Hammerum, Ringkøbing, Denmark. Name Variation Inger Clemensdatter was also known as Clemmensdatter. Married Name before 1753 As of before 1753,her married name was Madsen. Inger Clemensdatter was born circa 1738 at Denmark. She married Niels Sügaards before 1753 at Ikast, Hammerum, Ringkøbing, Denmark. 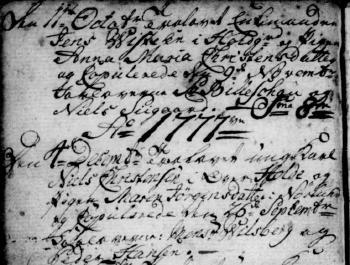 [S383] The Danish National Archives; Church Records, Potential marriage record for Niels Sugaand - 1776 - Ikast, Hammerum, Ringkøbing, Denmark. [S383] The Danish National Archives; Church Records, Inger Clemensdatter death record - 25 Apr 1791 - Bording, Hammerum, Ringkøbing, Denmark. Name Variation Thoger Nielsen was also known as Thøger. Name Variation Peder Nielsen Siigaard was also known as Siigaard. Name Variation Peder Nielsen Siigaard was also known as Peder Nielsen. [S383] The Danish National Archives; Church Records, Karen Clemensdatter birth record - 25 Nov 1792 - Bording, Hammerum, Ringkøbing, Denmark. [S383] The Danish National Archives; Church Records, Peder Nielsen Siigaard and Maren Madsdatter marriage record - 15 Apr 1794 - Bording, Hammerum, Ringkøbing, Denmark. [S383] The Danish National Archives; Church Records, Christen Klemensen birth record - 06 July 1796 - Bording, Hammerum, Ringkøbing, Denmark. [S383] The Danish National Archives; Church Records, Mads Knudsen birth record - 13 Nov 1805 - Bording, Hammerum, Ringkøbing, Denmark. [S383] The Danish National Archives; Church Records, Mads Knudsen birth record - 13 Nov 1806 - Bording, Hammerum, Ringkøbing, Denmark. [S383] The Danish National Archives; Church Records, Peder Knudsen Brunberg birth record - 16 May 1813 - Bording, Hammerum, Ringkøbing, Denmark. [S383] The Danish National Archives; Church Records, Mads Brunberg Klemensen birth record - 27 Jan 1815 - Bording, Hammerum, Ringkøbing, Denmark. 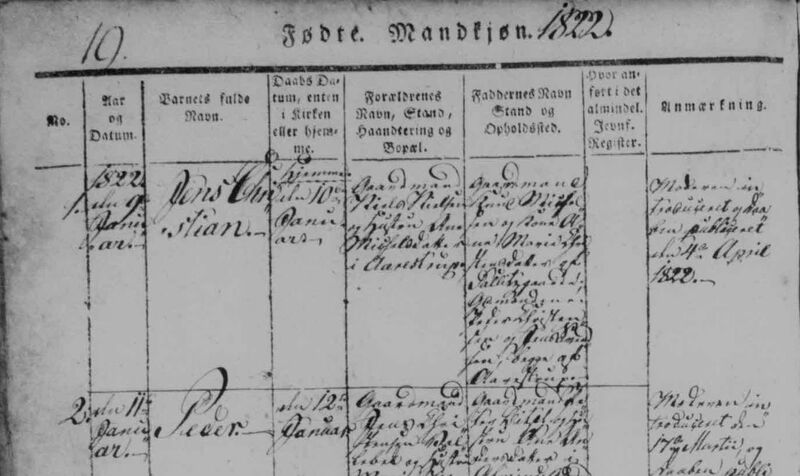 [S383] The Danish National Archives; Church Records, Anders Madsen and Inger Pedersdatter marriage record - 31 Oct 1818 - Bording, Hammerum, Ringkøbing, Denmark. 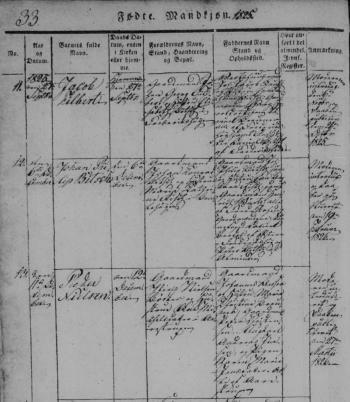 [S383] The Danish National Archives; Church Records, Jens Nielsen and Karen Pedersdatter marriage record - 13 Oct 1821 - Bording, Hammerum, Ringkøbing, Denmark. 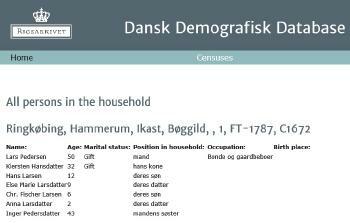 [S384] The Danish National Archives; Census Records, 1801 Denmark census. Kipno. B8960. Parish: Bording. Hundred: Hammerum. County: Ringkøbing. Record no. 268 of 467. [S383] The Danish National Archives; Church Records, Anna Kierstina Pedersdatter birth record - 26 Sep 1803 - Bording, Hammerum, Ringkøbing, Denmark. 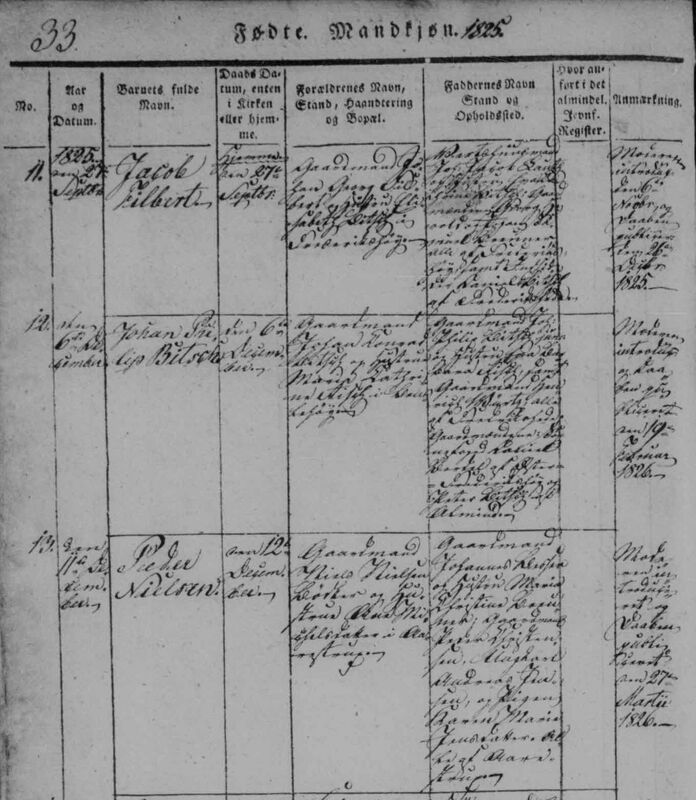 [S383] The Danish National Archives; Church Records, Niels Pedersen birth record - 24 Sep 1805 - Bording, Hammerum, Ringkøbing, Denmark. Name Variation Kiersten Nielsdatter was also known as Kirsten. Married Name 9 October 1791 As of 9 October 1791,her married name was Madsen. Married Name 9 October 1791 As of 9 October 1791,her married name was Sügaard. Anne Clausdatter was born at Denmark. [S383] The Danish National Archives; Church Records, Niels Sügaard and Anne Clausdatter marriage record - 09 Oct 1791 - Bording, Hammerum, Ringkøbing, Denmark. Name Variation Niels Madsen was also known as Niels Madsen Siigaard. Name Variation Niels Madsen was also known as Niels Madsen Sügaard. Niels Madsen was born at Denmark. Clemmen Andersen was born at Denmark. Name Variation Klemen Andersen was also known as Klemmen. Name Variation Klemen Andersen was also known as Clemen. He was the son of Anders Troelsen and Ane Marie Christoffersdatter. [S383] The Danish National Archives; Church Records, Inger Kirstine Christiansen Isen and Clemen Andersen - marriage record - 19 July 1898 - Ikast, Hammerum, Ringkøbing, Denmark. [S383] The Danish National Archives; Church Records, Clemen Andersen death record - 22 Aug 1936 - Ikast, Hammerum, Ringkøbing, Denmark. 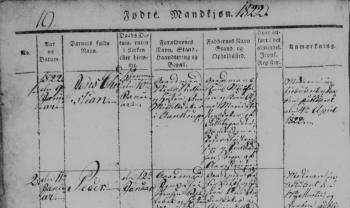 [S383] The Danish National Archives; Church Records, 1870 Denmark census. Kipno. D3217. Parish: Bording. Hundred: Hammerum. County: Ringkøbing. [S384] The Danish National Archives; Census Records, 1880 Denmark census. Kipno. C7063. Parish: Bording. Hundred: Hammerum. County: Ringkøbing. Record no. 1060 of 1349. 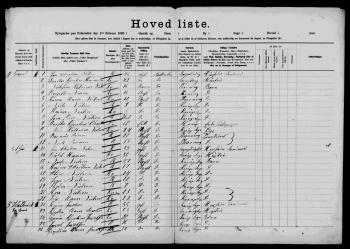 [S384] The Danish National Archives; Census Records, 1901 Denmark census. Kipno. D8080. Parish: Ikast. Hundred: Hammerum. County: Ringkøbing. [S384] The Danish National Archives; Census Records, 1906 Denmark census. Parish: Ikast. Hundred: Hammerum. County: Ringkøbing. 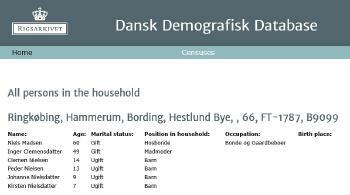 [S384] The Danish National Archives; Census Records, 1921 Denmark census. Ikast, Hammerum, Ringkøbing. Image 168 of 220. [S383] The Danish National Archives; Church Records, Johannes Viggo Andersen birth record - 01 Feb 1907 - Ikast, Hammerum, Ringkøbing, Denmark. Anders Troelsen married Ane Marie Christoffersdatter. Anders Troelsen was born on 15 May 1814 at Ikast, Hammerum, Ringkøbing, Denmark. [S383] The Danish National Archives; Church Records, 1860 Denmark census. Kipno. D3213. Parish: Bording. Hundred: Hammerum. County: Ringkøbing. Record no. 600 of 838. Married Name Her married name was Troelsen. Name Variation Ane Marie Christoffersdatter was also known as Kristofersdatter. Ane Marie Christoffersdatter married Anders Troelsen. Ane Marie Christoffersdatter was born circa 1821 at Denmark. Name Variation Christian Andersen was also known as Kristjan. Name Variation Christian Andersen was also known as Kristen. 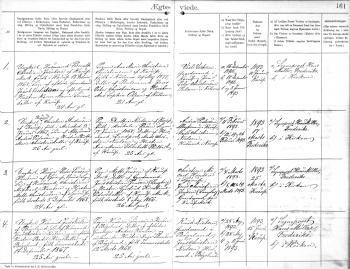 [S383] The Danish National Archives; Church Records, Kirsten Christiansen Larsen and Christian Andersen - marriage record - 01 Jun 1880 - Ikast, Hammerum, Ringkøbing, Denmark. 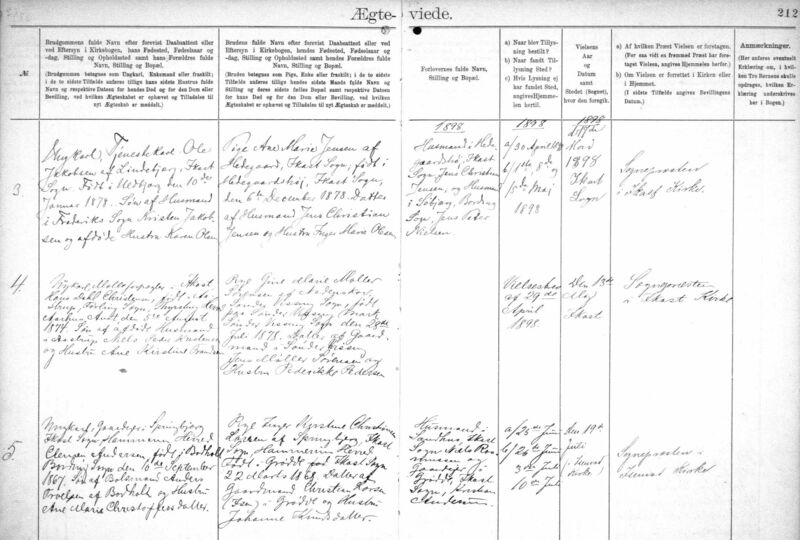 [S383] The Danish National Archives; Church Records, 1890 Denmark census. Ringkøbing, Hammerum, Ikast, Grøde, , 194, FT-1890, D6989. 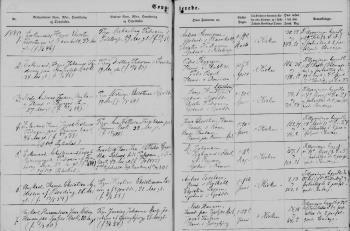 [S383] The Danish National Archives; Church Records, 1901 Denmark census. Kipno. D8080. Parish: Ikast. Hundred: Hammerum. County: Ringkøbing. [S383] The Danish National Archives; Church Records, 1906 Denmark census. Parish: Ikast. Hundred: Hammerum. County: Ringkøbing. 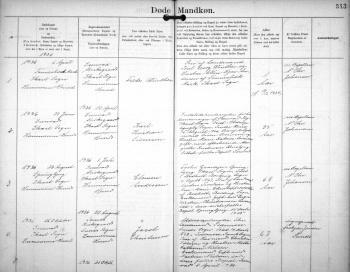 [S383] The Danish National Archives; Church Records, 1911 Denmark census. Parish: Ikast. Hundred: Hammerum. County: Ringkøbing. [S383] The Danish National Archives; Church Records, 1916 Denmark census. Parish: Ikast. Hundred: Hammerum. County: Ringkøbing. Page 122. Stamp 2034. [S383] The Danish National Archives; Church Records, Peder Knudsen Andersen birth record - 11 May 1887 - Ikast, Hammerum, Ringkøbing, Denmark. [S383] The Danish National Archives; Church Records, Anne Kirstine Larsdatter andSøren Pedersen - marriage record - 20 May 1857 - Ikast, Hammerum, Ringkøbing, Denmark. [S383] The Danish National Archives; Church Records, Anne Kirstine Larsdatter and Søren Pedersen - marriage record - 20 May 1851 - Ikast, Hammerum, Ringkøbing, Denmark. Name Variation Rasmus Christian Jensen was also known as Rasmus Kristian. He was the son of Jens Sorensen and Bodil Rasmusen. [S383] The Danish National Archives; Church Records, Ellen Marie Larsen and Rasmus Christian Jensen - marriage record - 28 Dec 1860 - Ikast, Hammerum, Ringkøbing, Denmark. [S383] The Danish National Archives; Church Records, Rasmus Christian Jensen death record - 08 Aug 1916 - Ikast, Hammerum, Ringkøbing, Denmark. [S383] The Danish National Archives; Church Records, 1870 Denmark census. Kipno. D3364. Parish: Ikast. Hundred: Hammerum. County: Ringkøbing. Record no. 101 of 1485. 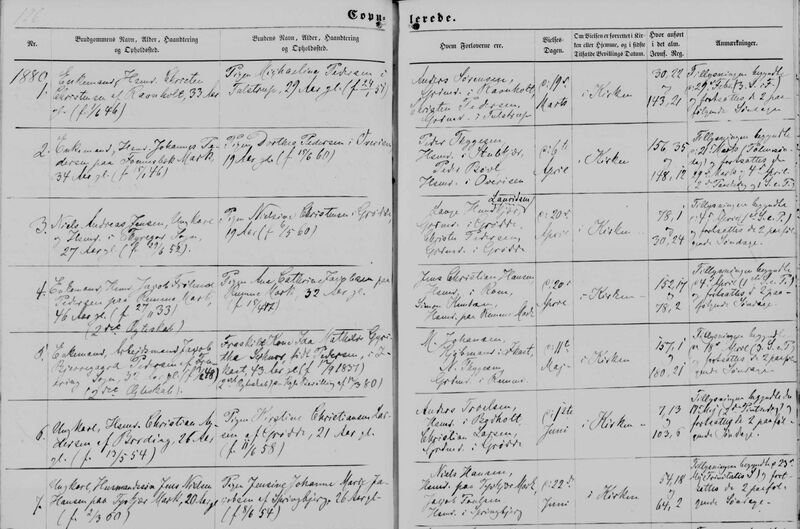 [S383] The Danish National Archives; Church Records, 1880 Denmark census. Kipno. C7064. Parish: Ikast. Hundred: Hammerum. County: Ringkøbing. Record no. 808 of 1876. 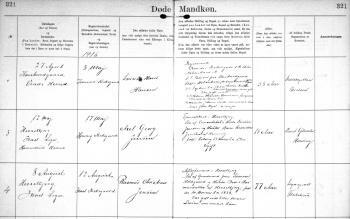 [S383] The Danish National Archives; Church Records, 1901 Denmark census. Kipno. D8080. Parish: Ikast. Hundred: Hammerum. County: Ringkøbing. Record no. 1779 of 2137. [S383] The Danish National Archives; Church Records, 1906 Denmark census. Name Variation Bodil Thomasdatter was also known as Thomæsdatter. Name Variation Bodil Thomasdatter was also known as Bodel. Married Name before 1799 As of before 1799,her married name was Nielsen. Bodil Thomasdatter was born circa 1772 at Denmark. She married Niels Nielsen, son of Niels Jensen and Bodil Larsdatter, before 1799. She was buried on 11 August 1816 at Frederiks, Lysgaard, Viborg, Denmark. 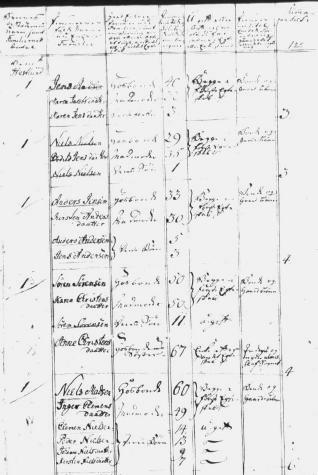 [S384] The Danish National Archives; Census Records, 1801 Denmark census. Kipno. B4459. Parish: Frederiks. Hundred: Lysgaard. County: Viborg. Record no. 406 of 422. Frederiks Søndre parish. [S383] The Danish National Archives; Church Records, Jens Nielsen birth record - 01 June 1814 - Frederiks, Lysgaard, Viborg, Denmark. Name Variation Bodil Hansdatter was also known as Hansen. Married Name 6 November 1851 As of 6 November 1851,her married name was Nielsen. Bodil Hansdatter was born on 16 November 1829 at Denmark. She was the daughter of Hans Andersen and Ida Nielsdatter. Bodil Hansdatter died after 1890. Jens Nielsen married Mine Nielsen. He was the son of Jens Christian Nielsen and Bodil Hansdatter. Translation: Born 14 baptised 15 December 1867. Son of Smallholder Jens Christian Nielsen and wife Bodil Hansdatter on Bøgelund. [S383] The Danish National Archives; Church Records, Jens Nielsen death record - 22 Dec 1950 - Karup, Lysgaard, Viborg, Denmark. 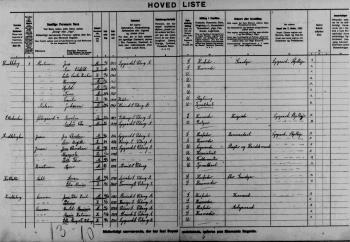 [S384] The Danish National Archives; Census Records, 1901 Denmark census. Kipno. D3012. Parish: Karup. Hundred: Lysgaard. County: Viborg. Record no. 269 of 301. [S384] The Danish National Archives; Census Records, 1925 Denmark census.